Great football weekend for the Parrys! Jake, Evan & Sam are a combined 14-1 this season. Jake's team and Sam's team are each 5-0 and Evan's team (Bountiful High J.V.) is 4-1 with their only loss coming late in the fourth quarter. This weekend, Sam's team took their 4-0 record into Park City. Sam scored a running touchdown early in the game which was called back for holding, but later threw the first touchdown pass of his young career. Parry to Foster. 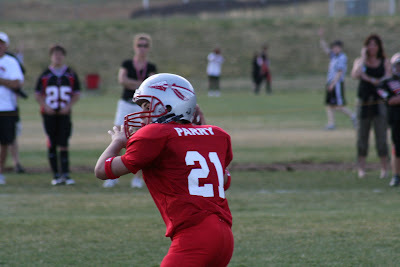 They eventually beat Park City 18-0, registering their first defensive shutout. The Park City mountains behind the field showed orange, red & yellow. It was a beautiful fall day (if a little hot at over 80 degrees). Keep winning Sam! Jake's team faced a Cyprus team yesterday that hadn't won a game. Perhaps this made Bountiful a little over-confident, as the score was tied 6-6 at the end of regulation. Jake's defense was stellar as always (teams often throw away from Jake's corner, because he has a reputation as a hard-hitting, good cornerback). After a 30-minute injury delay that required an ambulance, Jake's team finally finished off Cyprus in overtime, winning 12-6. This brings their overall record to 5-0. Only two teams in the Bountiful Region are undefeated (Jake's & Sam's). Bountiful High played Mountain Crest this week. Varsity lost 21-7, but the J.V. team chalked up their 4th win of the season, winning 46-10. 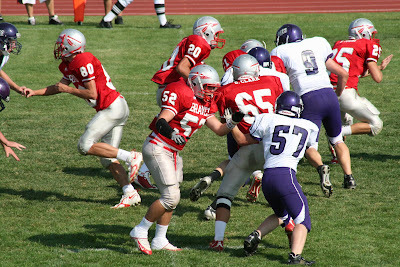 Evan (#52) had his best game of the season, tackling the kicker for a 20-yard loss and rushing the quarterback. He also did a great job at his O-line position, allowing the running backs to score several touchdowns. Up next for them this week: cross-town rival WX. We couldn't finish this post without mentioning that BYU moved up to the #8 spot in the national rankings this week. So, overall it was a great football weekend for the Parrys. I admit it, I didn't want to drive the extra miles and spend the extra time to attend a game in Yankee Stadium this summer. We had been so many times before and I didn't think the effort was worth it. Now I will also admit that I'm glad we went! Watching the game last night, the last game to be played in this stadium, made me nostalgic and a little sad and I was grateful we made the effort to attend Old Timer's Day this summer. 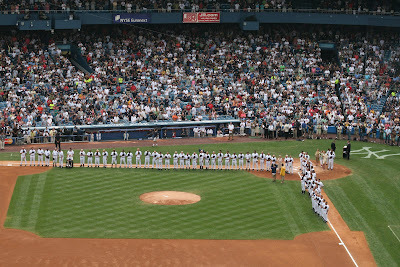 Not only did we see a great game between the Yankees and the Los Angeles Angels, but we saw over 50 old time Yankees return to this great stadium and we even saw them play a short game. 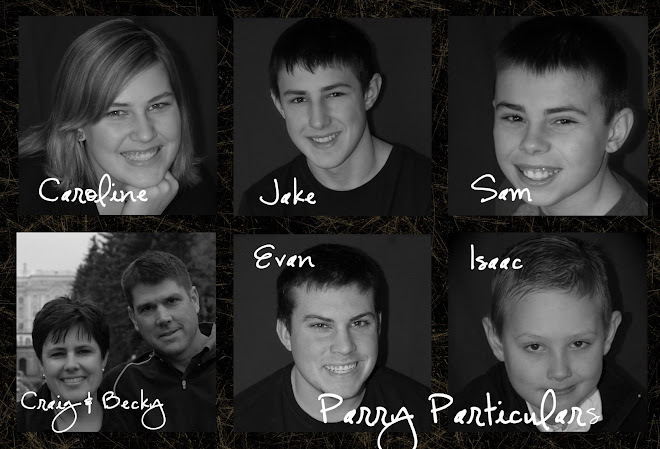 The Parrys (at least the adult ones) are new to this whole new blog business. I'll dive right in. We just visited our 25th Major League ballpark as a family. Five more parks to go. I think we will reach our goal of attending all 30 ballparks before Evan leaves on his mission. 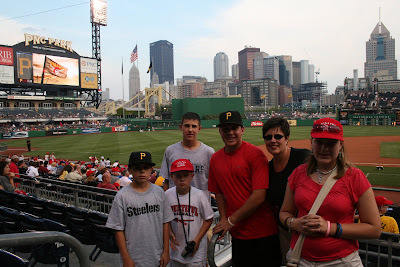 This summer we saw the Blue Jays play in Toronto and the Pirates play in Pittsburgh. As always, Craig planned a wonderful trip and we did everything these two cities (and all the ones in between) had to offer. Of course, as you can see above, Craig never gets to star in his own photographs. Evan is a junior in high school this year and is happy. 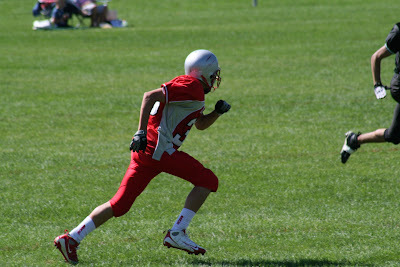 He is playing football this fall. His position was changed this year to offensive line and he loves it. As supportors, we are struggling to learn his duties and how to cheer for the line, but we've been told that if the running backs and the quarterback look good, the line is doing their job. He is also managing to get very good grades (3.9) and go to dances and still be a good boy. Go Evan! Jake is in 9th grade at Millcreek Junior High. He is happy and makes everyone around him happy. He also is currently starring on his football team. They are 4-0 so far this season and Jake was directly responsible for at least one of these wins. His interception and tackle on a failed extra point saved the game against Skyline. Caroline is a happy "sevie" (7th grader) at Mueller Park Jr. High. She can be found eating lunch with the boys because boys are usually her best friends. She can also be found hitting softballs all over the diamond on her fall "Orange Crush" team. She is getting so good on the violin and she is a breath of fresh air in a house full of boys. Sam is having a great beginning to his 5th grade year at Valley View. He loves his teacher and is happy in the "nerd" class. Sam is on an awesome football team that is also 4-0 (eight touchdowns for Sam so far). Sam is playing running back and scores almost every time he touches the ball. But more important than this is his love and conern for others. He is a great example to me. Go Sam! Isaac is a second grader (leaving Mom home alone all day). He is by far the tallest second grader at Valley View and probably has the biggest feet. Isaac is not playing any sport this fall, just supporting his brothers and sister and playing with friends. He can't wait to play football next year, and knows that because of his size he will be a lineman like his oldest brother. Icky is turning into a funny little boy and tries to be nice to everyone.